Posted by Matt on September 4, 2011 . Leave a comment. Last year I wrote a few bits (here and here) about trying find and build just the right stylus for my iPad. No luck. This March I was in Hong Kong and while waiting in a train station gadget shop for a friend buying some iSomething or another, I noticed a chunky, angular pen, with what looked like a rubber tip. Hallelujah! 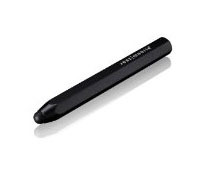 It turned out to be the AluPen from Just Mobile, and it’s hands down the best iPad Stylus I’ve ever used. Grippy, with a tip that is just hard and soft enough, it feels much like using a thick pencil. If you draw on the iPad, or just get sick of smudging your finger across all that lovely glass, you must try this thing.